“If all else goes wrong, get a dog,” – that was Rory’s advice to students as he gave the key note speech at Kirkby Stephen Grammar School’s prize giving. Rory was invited to speak to students, parents and teachers about ‘resilience’ as the school celebrated a year of achievements. He said that he didn’t have any great wisdom or insight to share on the subject of resilience but rather his experience in life has taught him that it every human is capable of the most astonishing resilience. 1. Change your socks and open the door. 2. Jump into the middle of them. 3. Never be afraid to walk away. 4. If all else fails, get a dog. The last part of advice was based on Rory’s walk in Afghanistan when his dog, Babur, saved his life. 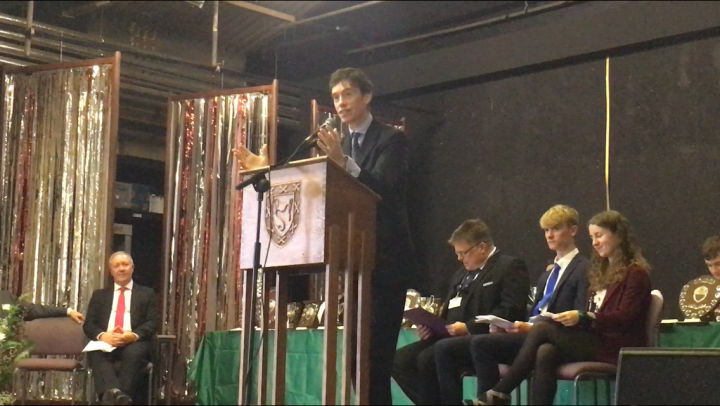 After the ceremony, Rory said: “It was brilliant to visit Kirkby Stephen Grammar School and I’m very honoured that they invited me to give out the prizes. I very much enjoyed meeting the students and staff and hearing about the school’s achievements in the past year.